The above - a photograph by acclaimed photo-journalist Tim Gordon - is the new cover of Highland Call. This represents a completely re-recorded and remixed/re-mastered version of the project, bringing it up to the original intended quality. It includes a guest performance on snare by Damon Small and the bonus tracks Tears of the World and The Carefree Tailor not originally included on Highland Call 1998. The Pretender Will Cam Nae More (D-B. Smith); Fear a Bhata - The Boatman (Traditional); Siuil a Run - Move, My Treasure (Traditional); Longships (D-B. Smith); An Coineachan - The Fairy Chase (Traditional); Giants’ Dance (D-B. Smith); The Tocherless Lass (Traditional); Chi Mi Na Mor-Bheanna - The Mist-Covered Mountains of Home (Traditional, John Cameron, Ballachulish); Tears of the World (D-B. Smith); Cearcall A’chuain - The Ocean’s Cycle (Calum & Rory MacDonald)/Oran Na Maighdinn-Mhara - The Mermaid’s Song (Traditional); Mo Run Geal, Dileas - My Faithful Fair One (Traditional); Farewell to Fiunary (Traditional); The Islay Maiden (Traditional); Lament for James of the Glen (D-B. Smith); Farewell Duncan McJohn of MacLaurin (D-B.Smith); The Carefree Tailor (D-B. Smith). Cover photograph by Tim Gordon, ©1996, from the book Turas Troimh Alba (Journey Through Scotland). 515 Woodland Hills, Carthage, Mississippi 39051. 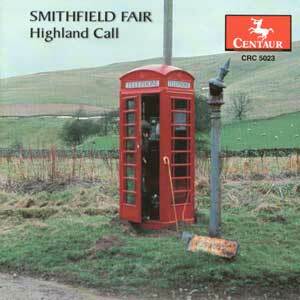 Back to the Smithfield Fair Homepage.